Boats, cars, trains and no planes. Traveling from Kimberly, British Columbia to the Himalayas is no easy task. Add two kids and no planes to the equation and most people would panic — but not the Kirkby family. Travel Channel’s new series Big Crazy Family Adventure chronicles one brave family’s 13,000-mile odyssey to the other side of the world, but there’s a catch: they can only take boats, cars and trains but no planes. The old adage about the journey vs. the destination couldn’t be more applicable than it is to this show. 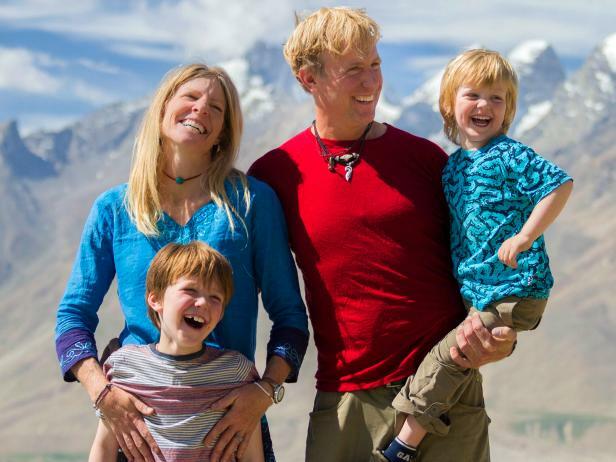 From the Ganges to the Pacific Ocean, the Potala Palace in Tibet to South Korea, Canadian couple Bruce Kirkby, Christine Pitkanen and their two sons Bodi (7) and Taj (3), traverse extreme changes in cultures and climates. FishbowlDC had the chance to catch up with the globetrotting family while they visited our nation’s capital. Among other things, we discussed the unfair stigma behind traveling with children. “The trick to traveling with kids, you’re a family so once you get out the door and get that momentum, it’s not too different from going to Disneyland for a few days,” added Christine. They even revealed a possible adventure route for a 2nd season. Whether or not you have a family, or simply love to travel, this show is more than worth getting into. While the network premiere of the series is set for Sunday, June 21, at 9 p.m., the series will also premiere online and on demand on 6/14 – one week before it premieres on air. The first episode is already available on their website, but just a warning: once you watch, you’ll be hooked. Watch the trailer, courtesy of Travel Channel.